Keep knives and other frequently used tools and utensils conveniently within reach with this wall-mounted Magnetic Knife Holder. They can hold sharp knives, tools and utensils securely. And it also won't dull knives. The Egg Skelter can hold up to 24 eggs (capacity varies based on the size of your eggs) and makes a perfect addition to any kitchen. Color is silver. Egg trough is 1.90" in width. 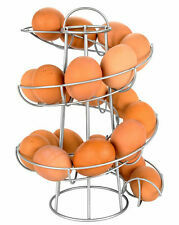 - Holds up to 24 eggs (but maximum capacity varies based on your egg size). 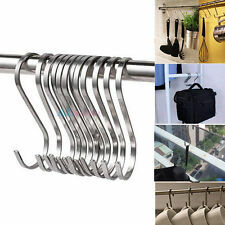 With these simple and functional stainless steel S hooks. 12 X Flat S Hooks. Use them in the bathroom to hang washcloths, loofas, body brushes, toiletries, towels and robes. works great for hanging your kitchen tools,such as pans, pots, spatulas, coffee mugs, hand towels, potholder, spoons. The S shape is suitable for hanging on existing objects without the need for screws and nails. 10 Hook Under-the-Shelf Mug Rack, Metal Cup Storage Holder & Drying Rack, Silver. 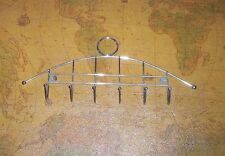 Description: - Metal under-the-shelf coffee mug/tea cup rack with 10 hooks. - Installs easily without tools: slide rack over any shelf less than 1 inch thick and at least 12 inches deep. - Can also be used under desks, tables, shelves, and workbenches to hold keys, small tools, cords, or utensils. - Approximate Dimensions (in inches): 3 H × 7.3 W × 11 L; Distance Between Hooks - 2.5 inches. Combines with other accessories in the GRUNDTAL series. Wipe clean with a soft cloth dampened with water and a mild dish detergent or soap, if necessary. Key features. Wipe dry with a clean cloth. - Can be used in high humidity areas. This 6-Pc. Wall Mounted Coffee Mug Rack is an easy and convenient way to keep your kitchen clutter free. A fourth bar is used to hang the 2 included baskets which are ideal for storing your coffee and tea accessories. Hanging Pot Holder Pan Hanger Cookware Hooks Rack Iron Kitchen Storage Organizer. 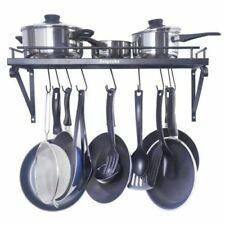 Hanging Pot Holder Pan Hanger Cookware Hook Rack Iron Kitchen Storage Organizer. Product Material: Stainless steel. Start organizing your kitchen like a professional chef! No room for under cabinet or drawer storage?. Number one on the market, they combine well with all hanging kitchen tools and accessories and are compatible with most cookware racks. Uses: Back door design can be placed on the cabinet hanging. Cabinet gadgets can also hang rags, brushes and more-. Product weight: about 50g. Trending at $4.69eBay determines this price through a machine learned model of the product's sale prices within the last 90 days. 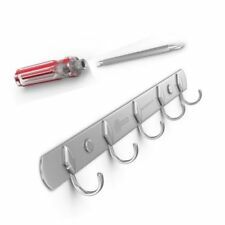 5PCS Stainless Steel S Shape Hooks Kitchen Hanger Rack Clothes Hanging Holders. 5 x S Hooks(stainless steel). Great For Hanging Plants Out Doors, In Hot Houses & Camping. Material: Stainless Steel. It is very powerful for hang many things. L Size stainless Steel hooks. 3 pcs L Hooks. Material: stainless Steel. Can load-bearing maximum to about 20KG. Product Description: Ideal for storing sponges Made of stainless steel, durable to use Specification: Material:Stainless Steel Size:5x5x3.4 cm 1.97x1.97x1.34 inch Weight:60g Color:As shown Package included: 1*Storage Rack Brand Homenhome MPN Does not apply Condition 100% Brand New Country/Region of Manufacture China Material Stainless Steel Size 5x5x3.4 cm 1.97x1.97x1.34 inch Weight 60g Package included 1*Storage Rack UPC 682365636485. Ikea Grundtal 5 pc S Hook Hangers - 2.75"
IKEA 5X Grundtal Hooks. YOU ONLY GET ONE pgk NOT 4, I HAVE 4 pgks available! Every effort is made for accuracy. 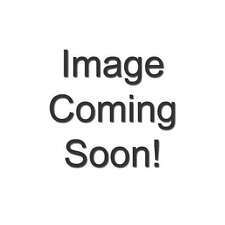 5 out of 5 stars - Ikea Grundtal 5 pc S Hook Hangers - 2.75"
3 product ratings3 product ratings - Ikea Grundtal 5 pc S Hook Hangers - 2.75"
With these simple and functional stainless steel S hooks. Use them in the bathroom to hang washcloths, loofas, body brushes, toiletries, towels and robes. 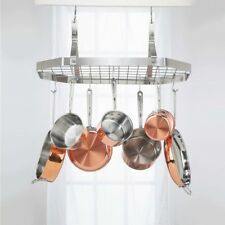 works great for hanging your kitchen tools,such as pans, pots, spatulas, coffee mugs, hand towels, potholder, spoons. Each 'S' Hook Has A Sharp Pointed End Either Side. Long Size:15cm. We will try our best to reduce the risk of the custom duties. This kitchen couter microwave oven rack is essentail for your daily life. Greatly enhance space saving,make your kitchen tidy and clean. Multi-functional, sturdy and durable. 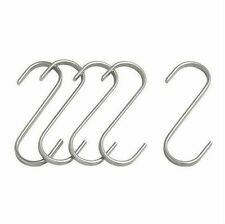 Eight hooks on the microwave oven shelf sides, perfect for hang the spoon, spatula, shovel or small kitchen appliances. 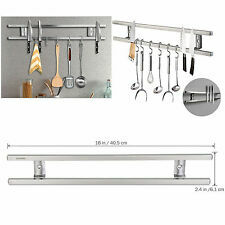 Kitchen Storage Rack Cupboard Hanging Hook Hanger Stainless Steel Organizer. Use them inside a cupboard to hang kitchen utensils, hang a towel in a bathroom or hang a necklace in a closet. Features: 5 Hooks, Drill Free, Space-saving. Both can be cut to any size, using a hacksaw or pipecutter. Mirror polished finish. Net design of the soap rack, easy for water drip and ventilation. The soap rack is Stainless Steel, sturdy and durable to use. The soap rack can be removable, and use repeatedly. 1 x Soap Rack with hooks. Lot 3 IKEA Grundtal Round White Caddy’s w/ SS Hanger Rail System 401.167.44 NEW. Condition is New. Shipped with USPS Priority Mail. 3, Multipurpose: This wall hanger can holds spoon, towels, gloves, knife and fork, pan, pot, keys or other basically anything you want to have hung up in your kitchen, bathroom or other places. And there are 2 choice of installation. 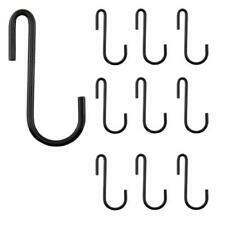 IKEA GRUNDTAL 10 hooks 2 3/4" each. Combines with other accessories in the GRUNDTAL series. Wipe clean with a soft cloth dampened with water and a mild dish detergent or soap, if necessary. - Can be used in high humidity areas. Dishwasher Safe / Mirror like Finish / Twinkling Grossy Surface / Match well with Silverware. Keep your kitchenwares organized and within reach with this handy, attractive, hygienic stainless steel kitchen ware holder. Hook Length: 9cm. Color: Silver. Can be hung on KUNGSFORS rail. May be combined with other products in the KUNGSFORS series. Stainless steel. Maximum load/hook: 9 lb. Maximum load/hook: 4 kg. Wipe clean using a damp cloth and a mild cleaner.